As an antidote or astringent supplement to the estimable The 1938 Club blogging week, I’m posting the last in my miniseries on British political fiction, from the Really Like This Book podcast scripts. Trouble is, it’s not fiction: it’s a polemic, it’s a historical record, and it’s by George Orwell, from 1937. 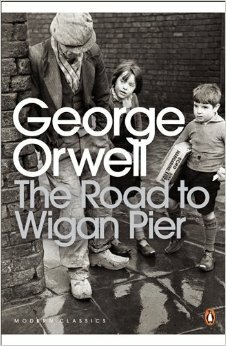 The Road to Wigan Pier is not a novel but it is an utterly readable account of the sufferings of the British working-classes in the 1930s, and the mess the class system has got us all into after the First World War. It is very, very political. Reading this beside the works from 1938 posted this week by bloggers the world over (we hope), will give political and cultural context for the British way of life. In 1936, when this book was researched, Orwell was already a noted essayist, and had already published a book on the British underclass. He specialised in pulling back the carpet from the floor of British self-image, to show the world what they didn’t want to know about. 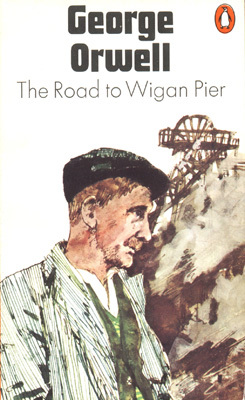 The Road to Wigan Pier was commissioned by Orwell’s publisher Gollancz, as an investigation of poverty among the British working-classes in the north of England, and was published by the Left Book Club, a highbrow series of books aimed at the left-wing intelligentsia and other fashionables. If you were a serious person in the 1930s you read Left Book Club books. So this book about the underclasses, the unemployed, and the poverty-stricken and disadvantaged was to be read by the moneyed advantaged who wanted to be educated in a way that went beyond just statistics. What is particularly interesting about this exposé is that the success of the book depends on Orwell – already a celebrated analyst of poverty and social injustice – being the author: there is no anonymity in the narration. Wigan Pier is reportage, we know exactly who is speaking, his views, his opinions, his previous works. He mentions his earlier books, to suggest further reading, and to fill in the gaps in his account of his own class experience. But above all, he keeps reminding us that he, George Orwell, polemicist and furious angry left-wing young man, is an authority on suffering and mismanagement. His narration reinforces the validity of what he’s writing about. The book is in two parts: part 1 is an account of living conditions in some parts of the north that Orwell lived in himself, and part 2 is a long essay in several chapters on the British class system, on Empire, on the squeamishness of the middle-classes when faced with the working classes, and what is wrong with Socialism in Britain, and how it could be so much better. If you want to find out about the everyday filth, discomfort, lack of privacy, lack of dignity and lack of basic hygiene that were normal living conditions in the 1930s for hundreds of thousands of British working people struggling to live decently, and for the unemployed, the homeless, and the abandoned, this is the book for you. 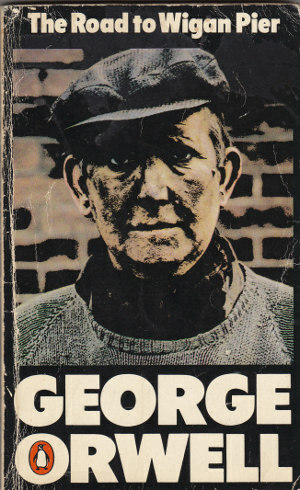 Orwell stays in a lodging-house, he goes down a coal mine, he visits miners’ cottages and the homes of the unemployed. He watches families without a wage-earning member scrabble for scraps of coal from the slag heaps. He works out weekly income from pay slips, and calculates the stoppages for tools, contributions to a fund for the death of a colleague, union dues. He’s counting pennies, not pounds, because that’s all there was for the underclasses to live on. Orwell does to tend to cover men’s work and men’s lives rather than those of women and children. Women and children lurk in the hovels and in the single room for 8 people, and Orwell is very sympathetic about the impossibility of keeping things clean with no water, no toilet and barely any money (he had lived in conditions like this himself, trying to make a name as a writer). But since he’s most interested in work and the lack of work, men are the focus, since men were the dominant wage-earners in the 1930s. 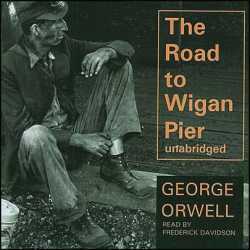 Wigan Pier is a one-sided account, not a complete picture, in many ways. Orwell visited the areas that interested him, so we hear nothing about distressed fishing communities in the north-east or agricultural poverty, or about extreme urban slums (though, to be fair, the London slums had already been written about in depth in the 1890s). In Part 2 he talks a lot about other writers and agitators who had covered this ground before him, and who are active at the time he wrote: not one of these opinion-formers and reporters is a woman, whereas many, many women were investigative journalists and novelists writing about poverty: perhaps Orwell didn’t think their views worth mentioning? He talks about Socialism with familiarity, as if it were the normal everyday political affiliation that most people had at the time, but he only sneers at the other political colours of thinking. This is not a magisterial history book: it is absolutely a polemic from a single perspective. Orwell is very open about his own perspective: he uses his own case as an example of how one can grow up with prejudices from the upper middle classes and how this can colour all your relationships and attitudes for life, unless you work hard at eradicating them. How do Orwell’s prejudices affect how he writes? It’s clear that despite all his respect for the amazing physical prowess of the miners, and his empathy for the miserable lives in filthy, cramped back-to-back houses, he writes as if the lower classes are ‘other’, alien and different. He is the outsider observer, but he can also get away, back to clean beds and regular meals when he wants. This difference, this knowledge of an escape route, sets a big distance between himself and the men he shares a bedroom with in the lodging house, between himself and the miners who he watches on their knees hacking at coal. He’s exploring a different world, and this book is his report from far away. Even his language betrays this unconscious attitude: he uses the vocabulary of the collector: the people among whom he lives are specimens, types, typical or not typical. He continually brings in assumptions of a norm that he and the reader share, like a ‘proper sleep’, because this is what is not found in miseryland. How does Orwell relate to his reader? What makes his writing so accessible, immediate? There is intimacy in his descriptions, of human experience in detail, about specific events and instances. His language constantly draws you in. He sets himself as the measurement, so we can share his observations: ‘what I most admired’, ‘it struck me that’. He uses conversational hyperbole, conversational exaggeration, wherever it will make the strongest impact in telling a story. When he wants us to remember an instance or a fact, the rhythms of his words change, and he ends the anecdote with a bang of hideous, dreadful, appalling, insupportable, terrible. There’s also a lot to alienate the reader in Wigan Pier. Orwell’s literary references are, obviously, only from the 1930s and before, and many of these will be unknown to the casual reader today. He mentions examples from the group of ‘the younger Communist writers’, who are all completely unknown today: this is literary archaeology. He uses Latin, which would certainly not have helped any reader from the working classes whom he wrote about, and probably won’t mean much to many of us today. He uses acronyms and abbreviations we won’t recognise, and refers to institutions that we don’t know. He uses statistics, which is good and proper for a book on income and hours and the pennies people live on, but they can be heavy going, though mercifully only appear in patches. And he has angry pet hates, things that he harps on about, that we might be a bit startled about today: his loathing for ‘creeping Jesuses’ and ‘Nancy poets’ is repeatedly expressed. Orwell’s political context was that Communism is quite normal, just as a vegetarianism is now quite normal, yet certainly wasn’t then: Orwell really finds vegetarians offensive. Communist-based institutions are praised as forward-thinking and solid parts of society, yet we don’t know any of them now. My, how times have changed. There’s a remarkable anecdote from when Orwell was a colonial policeman in Burma, when he spent an overnight train journey with a stranger, in tropical heat too hot to sleep in. They spent the whole night in conversation criticising the Empire, and parted the next morning still not knowing each other’s names, only that they both secretly and shamefacedly hated the institution in which they both served. The way Orwell writes about this, he may as well have been describing a night of abhorrent sexual practices, because the shame and secrecy in involved in criticising the Empire in the 1920s were analogous to committing adultery, or, even worse, committing acts of homosexual passion (then illegal). Orwell’s point in telling this story is that Empire-criticism was only just becoming respectable when Wigan Pier was published: for readers now, who are accustomed to routinely slanging the memory of the British Empire and all its works, this is a bit of a shock. Throughout Wigan Pier, when Orwell says ‘the war’, he only means the First World War. He can see, and we know, that the Spanish Civil War is approaching, and so is the Second World War. It’s like watching a train wreck, knowing what’s going to happen. I wince whenever Orwell says something about his own speculative future, of how many books he might write, or if he’ll be alive in fifty years time, because he died 16 years after Wigan Pier was published. 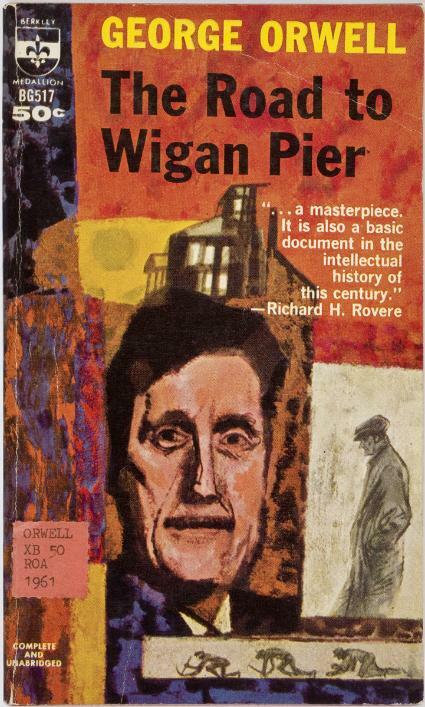 If you find Orwell’s fiction too brutal for enjoyment, as I do, try his non-fiction instead, and do try Wigan Pier; it is an excellent introduction to one of the greatest British political writers. I recently read this book for the first time. Your essay is very thorough and well documented. My general impression upon reading the book was – here’s a social scientist and journalist doing his utmost to grab the snobbish upperclass and wannabe middle class and give them a swift kick. Orwell’s super power, WORDS! and he wielded them mightily! Also recommend Christopher Hitchens lecture “Why Orwell Matters” on Youtube.